Still the #1 Ranked 360 Virtual Tour Kit on the planet. With over 12 years of experience, VPiX is the #1 provider of virtual tour equipment to thousands of businesses and photographers... worldwide. You got a camera and tripod? Then all you need is a VPiX 360 Camera Kit Upgrade. Best Rotator on the Market. Perfect for your Canon or Nikon Camera. Complete kit. Everything you need to start your very own virtual tour business. Stitcher for Mac or PC. and Click to Verify badge. These are TRUE Virtual Tours. Not like the fake ones you see on Visual Tour or TourBuzz. Those are slide shows. VPiX HD tours lets me sell my services to hotels, resorts and high end REALTORS. They love the quality and I love making $495 to $2,000 or more on every project I shoot. VPiX even lets me download the tours and host them on my own server. RealTourVision won't let me do that and their software doesn't run on a Mac, either. And I'm paying $1.95 per tour, too. Not $10 or $20. VPiX makes EasyPano TourWeaver, RealTourVision and TourBuzz obsolete. 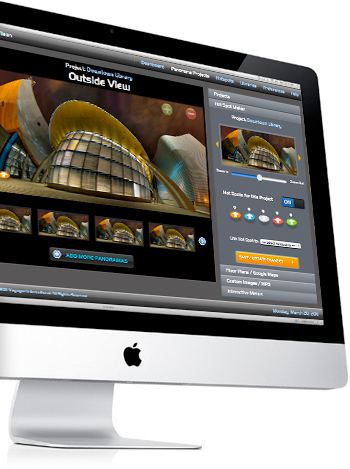 Create your jpeg panoramas at 6,000 pixels wide and 3,000 tall. Upload your panoramas to VPiX and add 3D radar hotspots to your Google maps and add custom floor plans. Save your tour, then export them and host them on your own server. It's a VPiX™ exclusive. Try VPiX FREE for 2 Weeks. No credit card needed. VPiX is now version 3.9 (FERRARI) and it's up to 30% faster. VPiX Go Pro adds e-commerce, a reservation or booking engine, custom URL's, VPiX 2 Go exports (so you can export HTML 5 tours and host them on your own server) and private (password-protected) viewing of tours. It's simply amazing stuff.